Solo is charged with two misdemeanor counts of fourth-degree domestic violence assault in Washington state stemming from a June 21 altercation with her sister-in-law and 17-year-old nephew at a family gathering. Hope Solo #1 of the United States stands on the field prior to playing Mexico at Sahlen's Stadium on September 18, 2014 in Rochester, New York. U.S. Soccer is standing by its decision to allow goalkeeper Hope Solo to continue to play while she faces domestic violence charges. She has pleaded not guilty and the case is scheduled for trial on Nov. 4. She faces up to six months in jail if convicted. Solo, who has been with the national team since 2000 and recently set the team record for most career shutouts, continued to play for the United States in exhibition matches and with her National Women's Soccer League team, the Seattle Reign, following her arrest. U.S. Soccer President Sunil Gulati said Monday the organization will let her play until the legal matter is settled. 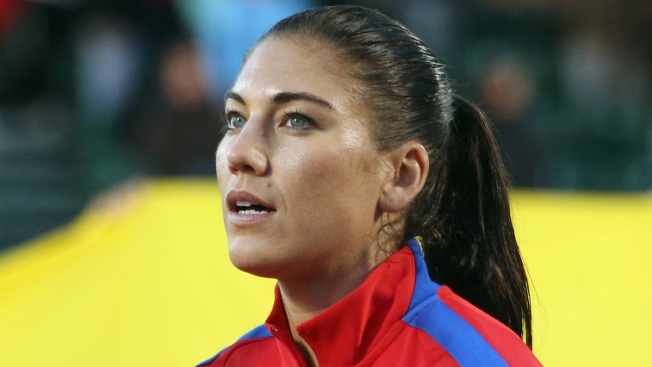 "U.S. Soccer takes the issue of domestic violence very seriously. From the beginning, we considered the information available and have taken a deliberate and thoughtful approach regarding Hope Solo's status with the national team," Gulati said in a statement. "Based on that information, U.S. Soccer stands by our decision to allow her to participate with the team as the legal process unfolds. If new information becomes available we will carefully consider it." Gulati's statement comes after U.S. Olympic Committee Chief Executive Officer Scott Blackmun said he was disturbed by the charges against Solo. But in a statement to USA Today he did not say whether he believes she should face disciplinary action, such as suspension, before the matter plays out in court. "The allegations involving Ms. Solo are disturbing and are inconsistent with our expectations of Olympians," Blackmun said. " We have had discussions with U.S. Soccer and fully expect them to take action if it is determined that the allegations are true." Solo is expected to start in goal for the U.S. women when the team plays next month in the CONCACAF championship, which will be played in four U.S. cities with the final scheduled for Oct. 26 at PPL Park in Pennsylvania. The event serves as a qualifying event for next summer's Women's World Cup in Canada. According to the court documents in the abuse case, Solo's 17-year-old nephew told police Solo was upset and appeared to have been drinking when she arrived at a family gathering. Following an argument, she and her nephew got into a fistfight, according to court documents. When the boy's mother tried to break up the confrontation, Solo punched her in the face, the documents said. The report also said that the nephew broke a broom over Solo's head and pointed a broken BB gun at her to try to get her to leave. Solo was released without bail. She was ordered not to have contact with the alleged victims and to not drink alcohol. "Hope is not guilty of any crime," her attorney Todd Maybrown said in an email to The AP following her arrest. "In fact, our investigation reveals that Hope was assaulted and injured during this unfortunate incident. We look forward to the opportunity to present the true facts in court and to having this matter behind Hope very soon." Solo issued an apology following her arrest via social media. "I love my family dearly. We, like all families, have our challenges but my sincere hope is that we are able to resolve this situation as a family," she wrote. "Adversity has always made us stronger and I know this situation will be no different." In an exhibition match against Mexico in Sandy, Utah, earlier this month, Solo recorded her 72nd career shutout in an 8-0 U.S. victory. She passed Briana Scurry (1994-2008) on the career list. Solo, 32, has played in 154 international matches and was with the U.S. team that won gold medals at the 2008 Beijing and 2012 London Olympics.